I got them, I finally got them. *Giggles like a little school girl* I'm ridiculously giddy right now. I finally found these at a salon in Calgary. 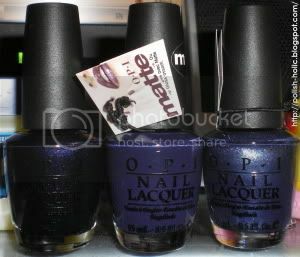 Anyhow, I knew the wear time for the matte and suede polishes were bad, as the little tag states. But I was actually surprised how bad. I tried OPI You Don't Know Jacques! Suede first (not pictured) and I had chipping by the next morning. You aren't supposed to use base or top coat. But I figured base coat might help with the chipping, so all of these swatches are done with b.c. I also used b.c. because when I used You Don't Know Jacques! without b.c. it ended up dying my nails. Swatches are also two coats of colour. Here is the matte done with classic shiny tips. I actually found having the tips made a huge difference in wear time. I completely botched the application because I didn't know how the matte would go on. I'd probably try this again just because so many people I talked to seemed to like it.The formula seems a bit thick, but other than that, it worked fine. You're also not supposed to put on lotion while wearing this, but Calgary is so dry that you can't avoid it. So by the end of the second day, the matte effect was turning a bit shiny. Next one up is OPI Russian Navy Suede. I absolutely loved this polish. I actually really love the way the suede polishes look. But that may just be because I'm a sucker for shimmer. 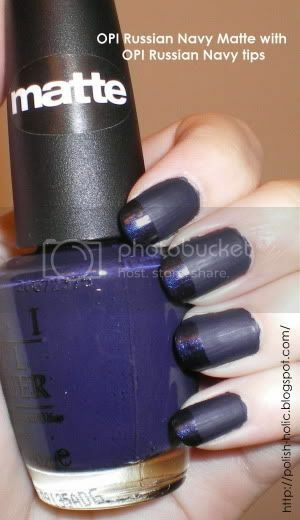 It's a blue matte polish with silver shimmer. I took this picture right after I put it on so I could get it before it started chipping. So damn perdy. These polishes go on a bit thick, but relatively smooth. They dry really really fast, good for if you want a fast manicure before going out. The one issue I have is the brushes. I don't know what's wrong with it. Don't know if it's just me, but one half of the brush would end up with lots of polish, the other half wouldn't have any. I tried changing up the way that I swiped the side of the bottle but it didn't seem to matter. It's just... odd. I don't know. Just an fyi, I guess. Thanks for this comparison. I didn't know there was a matte AND suede, so I had to look for a comparison before I knew which to buy. Perfect swatches - thanks!! Glad it was helpful. But those swatches leave a lot to be desired, may re-do them! Your comment makes me want to wear them again.